an interview. Image from Buzzfeed. Cormorant is a small town in Minnesota where the residents recently went to vote. The election for honorary mayor cost $1 to vote in and helped raise money for a local event. 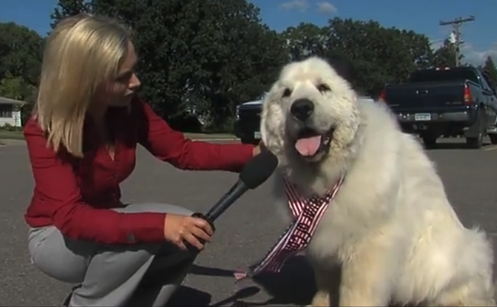 Duke, a 7-year old furry politician, won a landslide victory. Duke's closest competitor owns the Cormorant store, and didn't have half as many votes as Duke. Residents could vote for anyone they wanted, and put Duke's name on the ballot. The term lasts for one year, and a local pet store has donated his salary: a year's supply of kibble. After the win, Duke celebrated with a long grooming session and a new outfit. It sure makes me proud to be a Minnesota dog! Now maybe I need to run for mayor of my town! Homemade dog cookies for everyone that barks for me! You'd be a great mayor, Emma! Duke won with an overwhelming majority of votes, and I'm sure you would too. Duke is an inspiration! Now my dogs want to run for office too. Thank you for coming over!